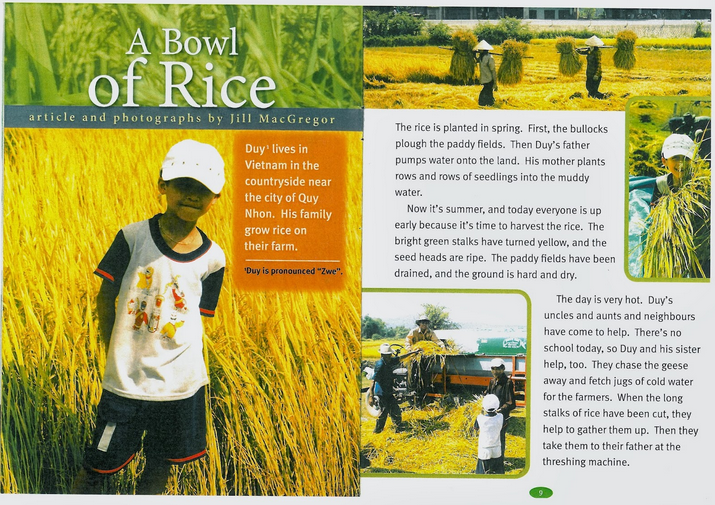 There is a boy named Duy who lives in Vietnam near the city of Quy Nhon. His family have their own Paddy field where they grow rice. In spring the rice is planted, first the bullocks come and plough the paddy fields. Now its summer, everyone wakes up early in the morning for them to harvest the rice, because the stalks have turned yellow, and the seed heads are ripe. There was no school…….so Duy and his sister helped too, and what they did was chasing the geese away and get some water for the workers/farmers. And then when the long stalks of rice have been cut off, those two siblings go help and gather them up. Then Duy and his sister take them to their dad at the Threshing Machine. The Threshing Machines job is to separate the rice grains from the stalks. And when the basket if full of rice grains, Duy helps the workers/farmers to pour the grain into this really large sack, and so when the grains are dried the workers/farmers drags the big sacks and they tip it out and rake the grains along to the side of the road so that it can get dried in the hot sun. 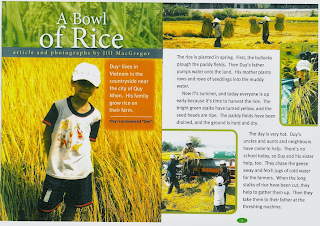 The next day on their way to school, Duy and his friends walked over the rice, cattles trampled (crush) on it and cars and bikes rode over it. But the grains were not damaged because it was protected by the husks of bran. After the grains are dry, Duys dad cleans them up by sweeping it and then he pours them into the milling machine. And when they finish everything, Duys mum and his aunt uses the stalks to weave baskets and hats and sell them in the supermarket. 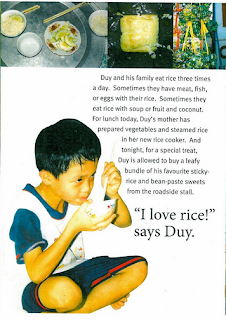 Duys mum has made vegetables and steamed rice for their lunch. “I Love Rice!” says Duy.